Perhaps this may be the last review of my new Wind until I have time to stress test it with practical use i.e. travel with it, yamchar @ Coffee Beans and video conference with it etc. Well, it may not sound like a review, perhaps it's the explanatory post to blog how did I end up with Wind. So how much then? RM1630 for one!! 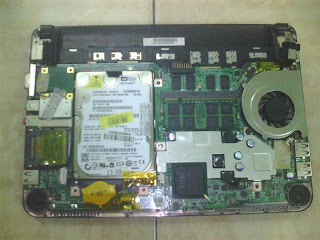 Hardware specification is like what I said in the previous blog, same with XP version, you can check it out here. 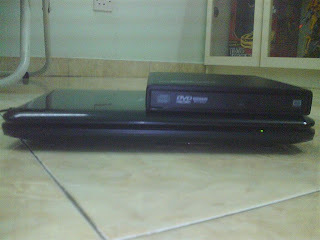 Cousin and I topped up RM70 each to get our Wind upgraded to 2GB RAM. You can see the RAM stick on the photo below, it's the back (or bottom) of the Wind in between the ventilation fan (right) and the 80GB hard disk on the left. We were a bit greedy, we attempted on 2GB RAM stick but as other forumers confirmed, Wind can not support it. It would be perfect to run Vista if we could get a total of 3GB RAM! I suspect the culprit is BIOS that restricts it, hopefully MSI removes this limitation on the next release of BIOS upgrade. Back to the money matter, so it's RM1700 per Wind equipped with 2GB RAM, compared to average retail price of RM1899 that I asked around SS2, Low Yat and Imbi. 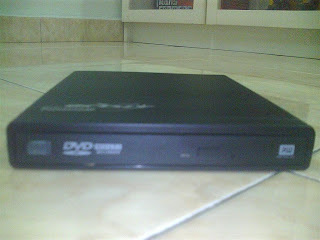 Since I budgeted around RM2000 for this round, I pampered my new Wind with a companion, a slim DVD Writer for RM270. Total, still cheaper than what I budgeted, and compared to if I were to buy it at RM1899 with XP Home, no upgrade to 2GB RAM and no external DVD writer plus to wait another 1 or 2 week! Haha! Yoohoo! Extreme excited with my deal!